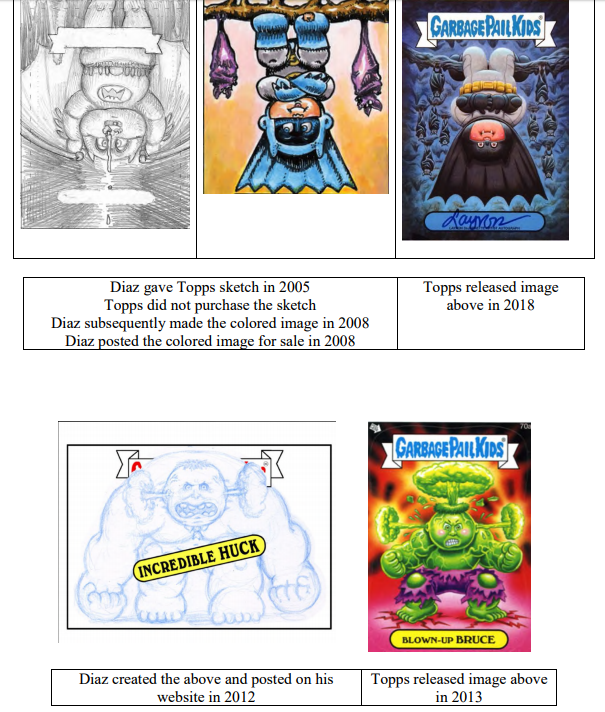 Last October, Topps sued a former Garbage Pail Kids artist named Luis Diaz for allegedly selling a line of knockoff products called "Garbage Parody Kids" or "Gavage Parody Kids." Topps alleged Diaz violated its Garbage Pail Kids trademark/trade dress, and sought an injunction and damages against Diaz. In an interesting turn of events, two weeks ago, Diaz filed counterclaims against Topps (legal translation: sued Topps in the same lawsuit), alleging 1) Topps' intellectual property (IP) for Garbage Pail Kids is not enforceable and 2) that certain Garbage Pail Kids cards infringe Diaz's own copyrights. Legal translation: "Hey Topps, your Garbage Pail Kids IP is garbage, AND, it's you that is the infringer, not me!" On their face, both defenses seem desperate, but, when you read Diaz's counterclaims, both defenses are worth a longer look…and I really like one of them. In his counterclaims, Diaz alleges that Topps' Garbage Pail Kids trade dress is not "distinctive" because it is not "unique." 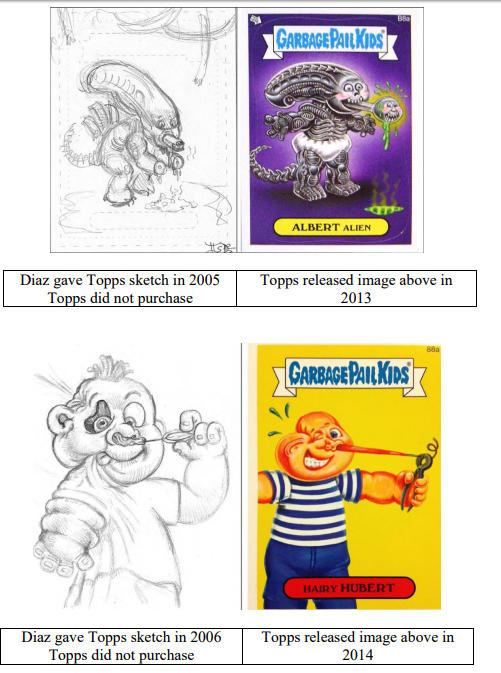 In support of his argument, Diaz relies on a 1986 lawsuit against Topps by a company named Original Appalachian Artworks, Inc. ("OAA"), who alleged that the Garbage Pail Kids were just knockoffs of its products. Who the heck is OAA? Just the owner of the Cabbage Patch Kids' IP. Legal translation: It's Diaz's position that Topps' IP consists of elements it copied from Cabbage Patch Kids. If true, then that IP is not distinctive or original to Topps, and therefore not protectable. And because Diaz allegedly only copied that non-protectable IP…he then is not an infringer. Legal aside: Despite the many linguistic contortions there, the defense—in theory—is sound. While there are differences between the marks, their overall similarity is clearly apparent in many respects (emphasis added). Both product names are displayed in an arc against a white cloud background. Cabbage Patch Kids and Garbage Pail Kids both contain three words. 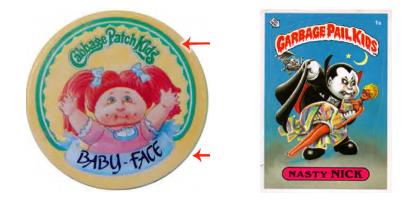 In this regard, part of Topps' allegations against Diaz is that the banner on the top of each Garbage Parody Kids and Gavage Parody Kids card infringes Garbage Pail Kids' banner. BUT, if a court has already found that Topps' Garbage Pail Kids banner is a knockoff of another product, then it's likely not protectable IP that Topps can use to stop others. This is an interesting strategy. It's basically, "You, Topps, are a knockoff. And as a knockoff, I can knock you off." A potential weakness to this defense is that even a knockoff can have protectable elements, so it's likely not a full defense for Diaz…but that misses the point. Companies love having as much IP as possible. The more you have, the stronger protections you have for your products. If Diaz is successful in knocking out some of the IP for Garbage Pail Kids, that gives a roadmap to Topps' competitors on how to make legal knockoffs. So, this claim could be a deterrent to Topps not because it's a get-out-of-jail-free-card defense for Diaz, but because it might help other would-be infringers in the future. Now, while this defense is interesting, I find it too complex to get much traction with a jury. Plus, it makes both sides look like bad guys (not to mention, it makes Diaz look like he infringes on Cabbage Patch Kids' IP). That being said, I love Diaz's other defense…that Topps infringed his works. It seems crazy that Topps might somehow infringe Diaz's works, right? I mean, Topps hired Diaz to make Garbage Pail Kids cards…so how can Garbage Pail Kids infringe a Garbage Parody Kids card that admits in the name of the card that it is a parody of Garbage Pail Kids? It all has to do with timing. In his counterclaims, Diaz reproduced terms of his contract with Topps. What Diaz highlights from his contract is that any of the art shown to, but not purchased by, Topps would be returned to him. Diaz provides examples of some of those works. Diaz also alleges that after Topps returned these works, Diaz obtained copyright registrations for them too. Why is this important? Because, in his counterclaims, Diaz alleges that even though Topps turned down purchasing the art for these cards, Topps knocked them (and others) off. Legal aside: I can see an in-house attorney at Topps grinding his or her teeth at this defense and grumbling, "Why did you guys need to make these cards to muddle our lawsuit?!?!" To prove copyright infringement, Diaz needs to show (basically) 1) that Topps had access to his works, 2) that Topps copied protectable elements of his works, and 3) that his works are registered at the Copyright Office. Diaz's counterclaims show all three, so, if the timeline he alleges is correct, his copyright claims look good to me. Why I like this defense so much better than the Cabbage-Patch-Kid defense is because of the story of Topps' "access" to Diaz's works. I litigate IP cases, and the ones that tick the judge/jury off the most are those where the accused infringer was offered an opportunity to buy the alleged infringed work, turned it down, and then came out with their own version. Diaz's complaint explains this is exactly what happened here. Also, when it comes to copyright infringement claims, attorneys' fees are on the table…and there's nothing better than winning a case and having the loser pay your bills. This does not mean that Diaz will automatically win. If Topps can show 1) it paid for/somehow owns these works and/or 2) can show what it copied was not protectable under copyright, it can still win. However, in copyright cases, I tend to find a good "access" story drowns out a weak, but viable, defense. So, at a minimum, I think Diaz's copyright infringement claims are what might drive the case from here. Now, I admit, Diaz's counterclaims are drafted to show him and his claims in the best light, so as I read them without any response from Topps, I'm swayed to his side. To be fair, you'll probably remember, when I read Topps' complaint against Diaz just a couple months ago, I was proclaiming that Topps would likely win this lawsuit too. So, I can't wait to see Topps' answer to Diaz's counterclaims to see which defenses it raises because the truth of any legal matter most times lies somewhere in between the claims of both sides. With Diaz's counterclaims, this case has become a mess for both parties. I could realistically see both sides winning some of their claims against each other. I can see Topps prevailing on some of its trade dress arguments, but I can see Topps being found guilty of infringing Diaz's work at the same time. Which could result in both parties just handing each other money back and forth. Which no one wants. Because of this, it wouldn't shock me if the case settles within the next 90 days. However, I hope it doesn't prior to Topps' answer to Diaz’s complaint (which should be filed in the next few weeks). I want to see Topps' responses to Diaz's infringement claims. Most likely Topps will just deny the claims with no more information, but here's holding out some hope that it provides more details on the history between Topps and Diaz.